Our volunteers are dedicated, compassionate people. They work in various areas around the Home, helping to enrich the lives of the thousands of homeless pets who come through our doors each year. 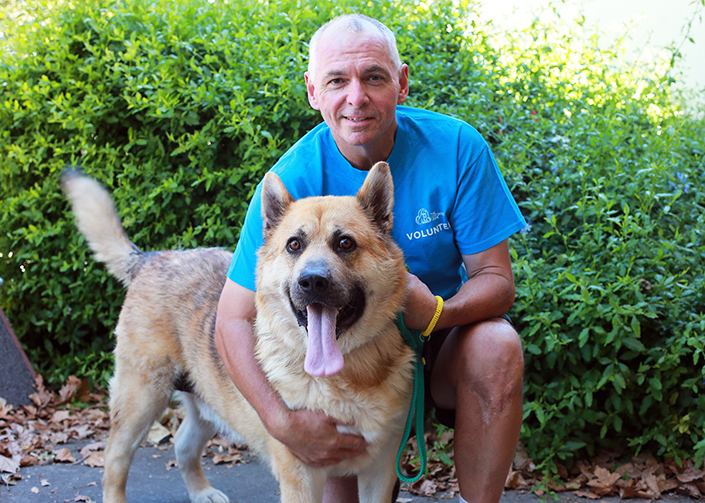 Richard is one of more than 200 volunteers (including foster carers) who donate their time to make a difference. To mark National Volunteer Week (8-14 May, 2017), we’re sharing his story. I was brought up on a farm, which was essentially a large market garden. We had several animals that we cared for and tended; they were really more like pets than livestock. We have adopted two dogs over 20 years from The Lost Dogs’ Home, who gave us a lot of enjoyment and happiness. I thought volunteering would be a way of giving back to the community in general and the Home in particular. I have been volunteering at the Home since November 2015 and normally attend Monday to Friday. A typical day entails several sessions of dog walking and enrichment. I usually walk each dog for around half an hour and then spend time with them in an exercise yard doing various activities, dependant on the dog. I sometimes work on foundation skills such as ‘sit’ and ‘drop’, agility work, noseworks (finding hidden treats) or just chilling with the dog and giving them a stroke. Two or three times a week I drive to the Home’s Cranbourne shelter to pick up animals who are brought back to North Melbourne for adoption. Sometimes I also pick up donations, such as blankets or pet food, from various sites around Melbourne. I also help transport animals to some of the Home’s rescue partners, the most unusual being a goat taken to a farm. I enjoy the varied requirements of my role, the shared purpose of the staff and volunteers to achieve the best outcomes for the animals in the Home’s care, and I really enjoy spending lots of time enriching and exercising with dogs. If you are a believer in animal welfare, volunteering is a proactive and enjoyable way of demonstrating this. The Home performs invaluable community service in reuniting pets with their owners, preparing animals for adoption and adopting out animals. Volunteering for few hours a month can make a huge difference to an animal’s enrichment and quality of life. 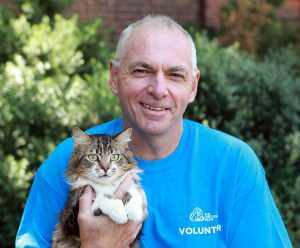 This National Volunteer Week, we celebrate and extend a heartfelt thank you to each and every one of our wonderful volunteers for their outstanding contribution to animal welfare. If you want to follow in their footsteps and volunteer your time to make a difference, we’re currently on the lookout for foster carers!